Originally this post was going to be called “The Value of Losing” and was going to focus on how much Simon has learned about losing with grace from his experiences playing soccer. I was planning to pen that entry immediately after the King’s Hammer Invitational Tournament, which you may have gathered did not go so well for Simon’s U-9 team. 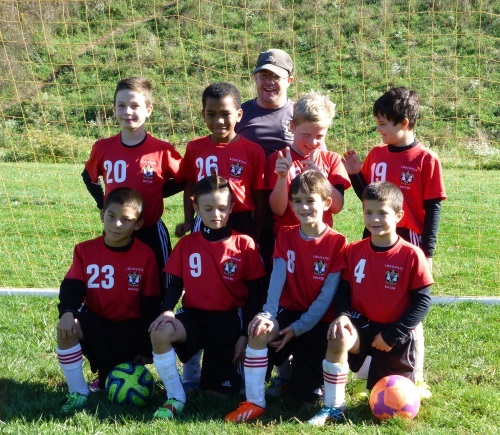 Then something funny happened: Simon’s U-10 team traveled to Elizabethtown Kentucky for a tournament, won three games out of four, and brought home the second-place trophy. He handled that pretty gracefully, too, which highlighted what my post should have been about all along: The Value of Competition. By virtue of being athletic and competitive, Simon is getting an education in an arena I have virtually no experience in. When I was growing up, I was competitive about grades, project-based academic competitions, and (sometimes) art. But neither of these things are determined in a single outing or in a single moment, and in both areas you are competing against your own best efforts as much as anything else. Nor did I compete much in board games, partly because my family didn’t play them much owing to others’ (echem, my oldest brother’s) difficulty losing. It’s sad but true that I adapted something akin to a “If I can’t win, I won’t compete” philosophy. I got past this (mostly) long ago, but it’s still a gap in my experience, and sometimes it affects how I discuss competitions with Simon. What I learned in the past 30 days is that I should just be quiet, because to quote William Wordsworth, “the child is the father of the man.” Simon doesn’t need any counsel from me. Let’s start with how to lose. 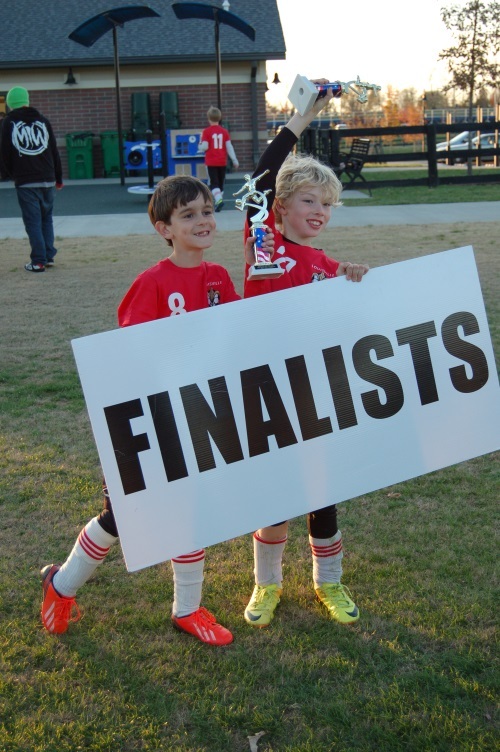 Simon’s U-9 team was invited to a tournament at which his team was wholly out-classed. Our club, LSA, was playing select teams from other clubs where only the best (and tallest!) made the team and where weekly games involve regional travel. The teams we played had no weak links: no slow kids, confused kids, or ball-hogging kids. It’s not that their best players were better than our best players, it’s that they had four times as many of them. How much wisdom lies in that short statement? Simon understood that he was playing more competitive teams, and with that understanding came acceptance. He knew there was no shame in losing to a better team, so he didn’t feel any. He just went out there, gave it his all, and chalked it up to experience. I got to the same place myself, but it took me longer, and that second game on Saturday was painful. On the flip side, when Simon’s same U-9 team ran up a score against a much weaker team in the last regular game of the season, none of the boys celebrated very much. After the first few goals they understood they were going to win and dialed down the exuberance. I remember Simon telling me later that day that their opponents weren’t very good and that they shouldn’t make too much of the win or do anything to make the other team feel bad. The Goldilocks competition came this past weekend, in the aforementioned Elizabethtown tournament. The field was pretty even, with either team having a chance to win or lose each game. The end result was exhilarating for Simon’s U-10 team and all the parents—seriously, an otherwise dignified and somewhat restrained highly successful professional mother hugged me so hard she picked me up—but the best and most lasting takeaway for me is that Simon played just as hard in near certain defeat as he did in a hotly contested battle. He’s got this. And while he’d much rather win, it’s the thrill of competition that does it for him, not any assurances of victory. Nope, the trophy is just the cherry on top of the delicious soccer (or tennis, or running) sundae. What a smart kid you and Matt are raising down there.